When the Russian Premier League resumed play on March 8, following the winter break, the table was split into three distinct groups. Three clubs had risen above the pack, CSKA, Anzhi and Zenit, separated by five points in the chase for the title and one of two Champions League spots. Beginning with Kuban, Terek and Spartak, all clumped six points beneath 3rd-place Zenit, another seven teams enjoyed an excellent chance at snagging one of Russia’s four Europa League places, awarded to clubs 3rd-5th in the league as well as the winner of the Russian Cup. Five of the eight teams remaining in the Cup are located in the table’s top six (only Spartak failed to advance to the quarterfinals), meaning the odds are high that a top-five team will win the tournament and gift the country’s final Europa League bid to the 6th-place team in the league. Kuban, Terek, and Spartak, though, faced a battle to secure European competition next season. Rubin and Lokomotiv lurked just one point back of the trio, while Krasnodar and hard-charging Dinamo trailed 4th place by just four and two points, respectively. Bringing up the rear, six clubs, Rostov, Amkar, Volga, Krylia Sovetov, Alania and Mordovia, had virtually no hope of catching even 10th-place Krasnodar and needed to focus their attention on avoiding relegation. 15th and 16th-place in the Premier League guarantees an exit, while the two teams in 13th and 14th must play the 3rd and 4th-place teams in Russia’s second division, the Football National League, at the end of the season to determine who takes the final two spots in the Premier League. Mordovia and Alania faced the biggest climb, seven and five points, respectively, behind 14th-place Krylia Sovetov. Only three points, however, separated 11th-placed Rostov and 13th-placed Volga, with Amkar sandwiched between the two. Every team had work to do this spring, kicking off last weekend in fairly miserable conditions across most of the country. Rubin’s pitch in Kazan, in fact, proved so poor that the club hosted Zenit 1,800 kilometers from home, in Grozny’s Akhmat Arena. Teams playing in Saransk, Nizhny Novgorod, Moscow and Samara weren’t as lucky, battling below-freezing temperatures and stiff fields. From a competitive standpoint, the biggest moves came at the top and the bottom. CSKA rolled past Krylia Sovetov, 2-0 in front of 22,000 in Samara, to climb five points clear of Anzhi (downed 2-0 in Saransk) and seven clear of two-time reigning champions, Zenit, who dropped three points to Rubin in their temporary Chechen home. Mordovia handed Anzhi their worst domestic defeat this season and caught Alania in 15th place, four points back of Krylia Sovetov, a fantastic result to begin their spring survival campaign. Rostov and Alania were the only other clubs to pick up a point in the bottom six. The hunt for the Europa League, likewise, tightened even further. Thanks to wins by Krasnodar and Dinamo, only four points separated 4th-10th. Each team faced 10 more matches. Would the Premier League bring the excitement club owners, television executives and die-hard fans so desperately wish for? Only a few more frigid March matchdays remained on the calendar. Spring does come to Russia, albeit reluctantly, and the potential for gripping football throughout the 16-team league down the stretch was high. Week 1 in the season’s final third did not disappoint, though some of the biggest headlines, admittedly, came from beyond the pitch. Shamil Lakhiyalov, the 33-year-old Krylia Sovetov forward, formerly with Anzhi, Terek and Krasnodar, isn’t well-known outside of Russia. Hailing from Makhachkala, Shamil began his career in his hometown, enjoyed a stint as captain with neighboring Terek, before returning in 2011 to play for Anzhi. Though he didn’t get much playing time, Lakhiyalov scored the first goal by a Dagestani in European competition against AZ Alkmaar last August. Many expected him to finish out the season with the team and possibly earn the first team title in his long career. In January, however, the striker didn’t join Anzhi at camp in Dubai. 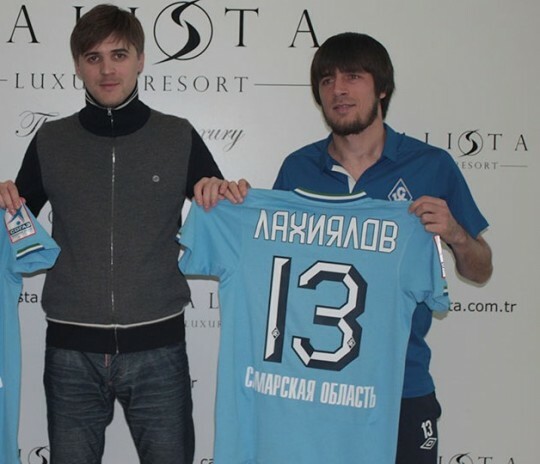 His contract, reportedly, had been torn up by the team and a week later, Lakhiyalov joined Krylia Sovetov, now coached by former Anzhi boss Gadzhi Gadzhiev. Life didn’t get easier for Shamil at his new club. Some of the hard-core fans in Samara informed the media and club that they were unhappy that a terrorist’s brother (Murad Lakhiyalov was killed by the Russian military in an anti-terrorist operation in 2005) and outspoken Muslim had joined their team. Their protests petered out in the dead of winter, but it still remained to be seen what, if anything, would happen when Shamil took the pitch. As coincidence would have it, his first appearance for Krylia Sovetov came on the road, in Makhachkala, in the first match in 30,000-seater Anzhi Arena. Aleksandr Shprygin, head of Russia’s fan union, recommended Lakhiyalov be punished: “The team’s coach, club management should discipline the player, because the fans see it and have a harsh reaction.” Krylia Sovetov, however, stood by their player, quoting him on Twitter that he had been overwhelmed by emotion on his return to Dagestan, and, presumably, was lost in thought during the anthem. The fan minority that opposed Lakhiyalov’s move to Samara in the first place, even calling on him to shave his beard, pick up another axe to grind with management. The incident made headlines on Russia’s sports websites, too, with most commenters skeptical of Lakhiyalov’s defense, guaranteeing the spotlight will be on him for weeks to come. Krylia fans, nonetheless, should have been more upset in the early minutes by Ewerton’s clumsy tackle against Lakhilayov in the penalty box, which the ref dismissed from a distance. Half an hour later, Amisulashvili received two yellows, leaving the visitors down a man after what had been an excellent start to the afternoon. But Anzhi, scoreless in their last three matches, including Europa League competition, couldn’t take advantage. Midway through the second half, Sergei Kornilenko, brought on for Lakhiyalov at halftime, blasted a shot past Anzhi keeper Gabulov to give relegation-threatened Krylia the lead. Anzhi finally woke up, pressing hard in the final twenty minutes for an equalizer and a winner, but they only managed the first, courtesy of Lacina Traore. Lakhiyalov, along with his coach and teammate Benoit Angbwa, all of whom were released by Anzhi in the last year and a half, got the last laugh. The Dagestani striker, a fan favorite during his years in Makhachkala, rubbed salt in the wound when asked about his return: “The Dagestani spirit of Anzhi is becoming less and less…” Whether he meant indirectly that the team’s character had also dropped with the almost complete absence of Dagestani players in Anzhi’s starting XI this season, it surely stung Anzhi fans that the club’s first match at the new stadium had been spoiled by recent cast-offs. A few hundred miles west of Makhachkala, Terek Grozny hosted Rubin Kazan. 26,200 fans attended Anzhi – Krylia Sovetov, the second-best mark of the weekend, while 24,000 showed up at Akhmat Arena, named in honor of Chechen President Ramzan Kadyrov’s father, Akhmat Kadyrov, who was killed in a May 9th terrorist attack at Grozny’s old Dinamo stadium in 2004. Though the game ended in a scoreless draw, allowing both teams to remain squarely in the hunt for European competition (Rubin are now 6th and Terek 8th in the jumble from 4th-10th), another extracurricular incident overshadowed the play on the field. Terek captain Rizvan Utsiev saw red in the 87th minute after a second yellow card. Moments later, Ramzan Kadyrov grabbed the microphone from his VIP perch and bellowed through the stadium loudspeakers, “The ref’s bought off, you’re a goat!” “Goat,” of course, is not the most polite Russian word to use when referring to an official at a football match. The Grozny crowd cheered with delight, but Terek now risk losing the right to play in Grozny for several matches for the outburst, possibly even the remainder of the season. The paucity of goals scored in the North Caucasus was symbolic of the weekend. Only two teams, lowly Amkar and Volga, recorded more than a goal, with a total of 15 goals over eight matches. Five belonged to Amkar, as they pasted Alania 5-1 at home in front of 6,250 fans. Their victory moved Amkar into 11th, still just two points clear of 13th-placed Volga, who recorded a vital 2-1 win in Rostov. Alongside Anzhi, Mordovia and Alania had miserable weekends. Mordovia’s 1-0 loss away to Zenit could be forgiven, but Alania’s embarrassment in Amkar may cost them dearly in May. 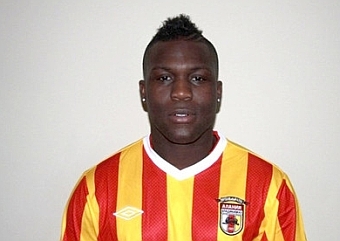 The third of three clubs from Russia’s North Caucasus, Alania brought in major reinforcements over the winter break, including former Real Madrid man Royston Drenthe, but took only one point in matches against Rostov and Amkar. Vladikavkaz boss Valery Gazzaev, four-time Russian champion with Alania and CSKA, is busy heading up the organizing committee for the proposed Russian-Ukrainian United Football Championship, and his club now sits five points adrift of 14th. Upcoming matches against CSKA and Anzhi may seal Alania’s departure from the Premier League, after just one season at the top, much like the club’s one year stay in 2010. Gazzaev is from North Ossetia, and immensely popular with Alania fans, having led the club to its only top-flight title back in 1995, but he’ll hear some complaints if the team fails to stay up. The club found a new sponsor this fall, RusGidro, a major player in Ossetia’s hydroelectric power industry, and coupled with Gazzaev’s recent return and roster overhaul, the fans expect more than 12 points through 21 matches. CSKA squeaked by Krasnodar, 1-0, at Moscow’s Luzhniki Stadium on Sunday to go seven points top of the table. Alan Dzagoev, the Army Men’s hotheaded North Ossetian, provided the winner in the first half, driving a low shot through a clump of Krasnodar defenders and past a surprised Alexandr Fyltsov, who made just his second Premier League appearance in his career. Fyltsov was sturdy, however, the rest of the match and Krasnodar threatened occasionally in the second half. Their best chance came early in the period. Igor Smolnikov had a look at the goal from inside the box, but blasted his shot high over the crossbar. Krasnodar manager Slabolyuv Muslin after the game discussed his team’s transformation after the break: “I told them there’s no reason to be afraid. We need to play our game. In the first half we only defended and did so poorly.” Next weekend, Krasnodar host Anzhi, another top club. If Muslin’s club can play with confidence for 90 minutes, Makhachkala will need to be sharp to break what’s now a five-game winless streak and maintain at least some pressure on CSKA at the top. Two thoroughly entertaining draws rounded out the action. 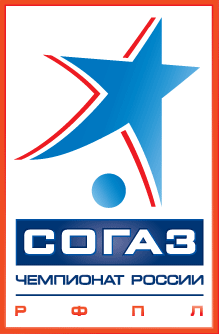 Spartak hosted Lokomotiv in a Moscow derby, while Kuban welcomed Dinamo to Krasnodar. Both matches had good attendance, twenty-nine and twenty-two thousand, respectively. At Luzhniki, Spartak enjoyed more possession and better chances – Bilyaletdinov and Dzuba missed opportunities in the second half to put the Red-Whites on top – but Lokomotiv goalie Guilherme kept the home team at bay to help steal a point on the road. Kuban and Dinamo scored their goals just minutes apart. Kokorin, Dinamo’s explosive 21-year-old forward, wore the captain’s armband for the first time and sent his team ahead in the 24th minute with a glancing header past a helpless Belenov. Four minutes later, Balde equalized for Kuban, slotting an Ionov pass into the Dinamo goal. That’s how the match ended, 1-1, helping Kuban keep pace with Spartak for fourth, while Dinamo remain in 7th. Amazingly, six teams of the seven teams bunched between 4th-10th picked up exactly one point over the weekend, with Krasnodar the only club to get shut out. The Premier League pauses for international action next weekend, with action resuming on Saturday, March 30. From that point on, the league will race through nine breathless matchdays, culminating on Sunday, May 26. CSKA look steady at the top; Mordovia and Alania hopeless at the bottom, but the scrum from top to bottom has never been better in Russia. Forget about La Liga or the EPL. Russia’s Premier League has all the excitement this spring. This entry was posted in Reports and tagged Anzhi Makhachkala, cska moscow, europa league, krylia sovetov, royston drenthe, rubin kazan, russia, russian cup, russian premier league, spartak moscow, terek grozny, zenit st petersburg by Andy Shenk. Bookmark the permalink.